Downsizing, Stress, Violence, and Suicide: What are the Risks? These general guidelines are for educational purposes and are not intended as professional or legal advice. Please seek counsel and consultation on specific situations facing your organization. During downsizing and redeployment feelings can run high, among those departing and among those remaining. This should not lead to inordinate worry about serious violence or someone “snapping” due to cutbacks. With a few additional indicators, the recognized warning signs of workplace homicidal violence can be relied upon during downsizing as well. Threat management teams or representatives can take proactive steps to screen for and better manage volatility. By themselves, these reactions should not raise concern about violence, but lead to recognized employer practices for assisting affected workers: severance packages, extended health benefits coverage, practical career transition services, and EAP counseling. Stabilizers or indicators suggesting an individual is less likely to be violent? Shows capacity & willingness to negotiate settlements, problem solve. Wants to avoid negative consequences (e.g. termination, arrest, prosecution) for threatening or intimidating others. The commonly experienced stress reactions to downsizing are primarily lessened by employers providing recognized career-transition support (as mentioned above) for those displaced. How messages are delivered is very important. Employees are keenly sensitive to their anxieties being regarded with respect, no matter how understandable the cutbacks are from a business standpoint. Leaders need to communicate promptly with information updates, listen patiently and responsively to concerns, and do what is possible to address understandable group and individual needs. With regard to violence potential, assume what is dignified treatment for the general workforce will help ameliorate the anger and acting out of anyone contemplating revenge, minor or major. If these measures do not help assuage such individuals, regard it as evidence that different approaches and resources are needed for these special cases. Threat management teams or representatives can take proactive steps to screen for violence and suicide risk prior to any individual job elimination announcements. Scan the lists of employees who will be laid-off. Who has shown a tendency to be volatile, display unacceptable levels of anger, or marked despair? Educate managers on warning signs and insist they come forward with concerns about affected employees. Confer with qualified risk assessment resources prior to taking any redeployment action with potentially volatile employees. If a serious risk of violence emerges, consensus building and planning are in order; legal, security, assessment specialization, and law enforcement involvement may be required. In spite of the above proactive steps to minimize problems, expect “surprises” on announcement days. Some anger is inevitable, in spite of lead times and employee awareness of possible bad news. Promptly support managers who are confronted with volatile reactions. Have HR managers or others with keen “people skills” designated and prepared to step into meetings to assist with heated conversations. Low-key security presence in the area or ready availability is appropriate, to respond to concerns of physical acting out. Again, an important guideline throughout this process is, “When in doubt, confer.” Violence has many causes, is complex, and difficult to predict. 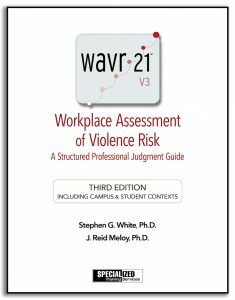 The vast majority of workplace risk of violence cases can be successfully and safely managed with early intervention and appropriate specialized resources.